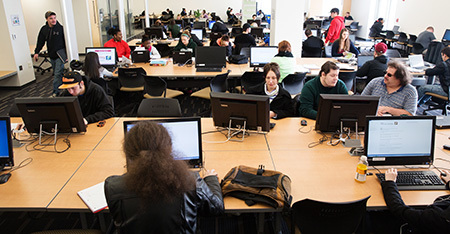 The LSC provides academic support to all students taking credit and non-credit courses at HCC. The LSC professional staff has content area specialties of English, writing, science, math, business, accounting and economics, and computer technology. In addition, staff has more than two dozen peer tutors with expertise in a vast array of subjects. The LSC offers individual drop-in tutoring (no appointments necessary), group tutoring, workshops, and specialized assistance with specific populations, such as TRiO: Student Support Services. Many students come to have a quiet place to study, even if help is not needed, because they do not have an appropriate study environment at home or elsewhere. Group tutoring is available for a variety of subjects to review material and support the learning process. Small study rooms are available upon request. Check with a staff member for more information. Additionally, we offer workshops on a variety of topics. See our Calendars & Workshops page for current listings. Computers with printing (Windows and Mac), scientific and graphing calculators, specialized graphics programs, science models, and technology equipment for hands-on training are available for student use in the LSC. Handouts, calculators, earphones, lab information, helpful texts, and other materials can be checked out for use while students are here. Additionally, the LSC offers student-led, drop-in tutoring for specific subjects. Please check with staff for a current schedule. Nursing Simulation Lab with Nursing Kelly patient manikin to provide nursing students with a quiet and private space to practice nursing skills, head-to-toe assessments, and bedside mannerisms. The lab is open afternoon/evening and Saturday hours for after class access.